Tip #1: Consider the real estate. Although blueberries will grow in part shade, they will grow even better in full sun. Tip #2: Before planting, work plenty of organic matter into the soil. I added shredded leaves and peat moss to my boxwood-edged bed. 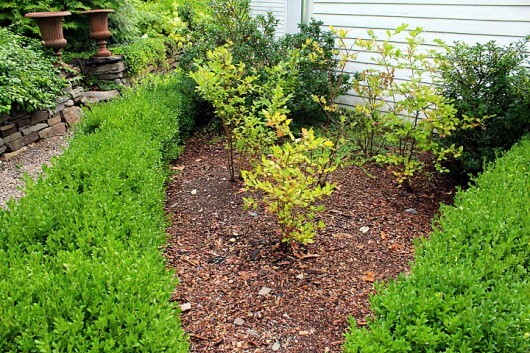 Tip #3: Never plant just one shrub! Cross pollination of different varieties will give you more and bigger fruit. I grow early-, mid-, and late-season varieties. Tip #4: Even if it pains you to do so, remove flower buds the first two years after planting. Otherwise, growth will be slow, and the shrubs will never amount to anything. I speak from experience. Tip #6: Mulch the bed with 2- or 3-inches of…something. Over the years, I’ve relied on shredded leaves, pine needles, and wood chips to mulch my blueberry patch. Tip #7: Provide adequate moisture. Blueberries, like most plants, prefer 1-2 inches of water per week. Tip #8: Provide acidic soil! Blueberries prefer a soil pH of 4.6 to 5.5 (I mistakenly said “6.0” in the above video. ) I rely on Espoma’s Organic Soil Acidifier to achieve to the proper pH in my blueberry bed. Was this post helpful to you in some small way? You can let me know by posting a comment. This post is immensely helpful. Now I know what I have been doing wrong with my blueberry plants – everything. Well, live and learn – I hope. Thanks! I recently moved to Maine and planted blueberry bushes last fall. I’ve never grown them before so your tips are really helpful. Thank you Kevin! Thanks, Kevin. Now it is just a battle between me and the bunnies!! I have only two varieties of blueberries in my six plant garden; they love one variety and leave the other one alone. It’s Easter and bunnies are so cute but…..LEAVE MY BLUEBERRIES ALONE! Heck! I am”ditto” on Pam’s comments. Sure explains why I am lucky to get 4 blueberries a year. Now in year 9. Definitely need to change out my process. Thanks, Kevin! I didn’t know you could root the prunings! A similar process to rooting boxwood, I imagine? Kevin, I just discovered some of your articles! Thank you for the great thin bags I’ve learned already. Will try tip#4 and #5. I knew blueberry plants liked acidic soil. And I recalled another gardener use pine needles in their azalea beds to add acidicity. When my blueberry plants were struggling and near death, I put pine needles several inches thick around each bush. It seemed miraculous and they recovered really well. They’ve been producing many many berries. Much more than I ever thought they would. I continue to do this every 4 months adding more pine needles. I’m looking forward to reading / listening to your other articles. So glad to know your wonderful tips! Thank you, Kevin. I plan to buy a few blueberry plants this spring! Always very helpful! I hope you do a post on hanging plants and if you use any water retention products. Right now I’m thinking baby diapers, but would be interested in any method you use. Thanks Kevin! Very helpful post and super excited to plant the clippings! I had no idea! Happy Easter, Mr. Kevin! 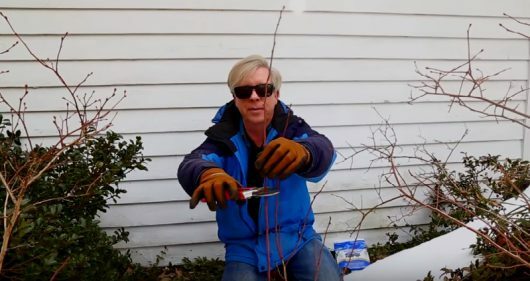 Are your blueberry shrubs full-grown? The varieties I find available locally are all described at 5-6′ tall and wide, which I don’t have room for, but yours don’t look that huge. Any advice? Such great tips Kevin. I do not have blue berries, but if I ever do plant them, I will use your methods. I do have miniature strawberries which produce the tiniest little strawberries that I have ever seen. I will be getting some Dwarf Lavender plants to plant in one of my perennial gardens, for the first time this spring and I would love any tips about how to grow it. It is supposed to get only 12 inches high, which will be perfect for my garden. I can’t wait to get it and get busy in my garden. Happy Spring ! What happens when the rabbits/mice eat your new blueberry shrubs down to the ground the first winter? They came back but didn’t grow very tall and there were no blossoms. As we head into fall, should I give them another year to see what happens or am I doomed? Thank you, Kevin, for your great advice about ………. EVERYTHING!! !